Yesterday I finally got out on the water again. I ran up to the Hiwassee for an afternoon of fishing, hoping that it would be as good as it was last time I fished a couple of weeks ago. It wasn't. While I did catch fish, it was slow except for when the generation pulse came through. The push of water came through right about the time that the hatch of little black stoneflies peaked. The fish went on a surface feeding binge and for the next 1/2 hour the fishing was good. The fish lost their timidity and were rising well. The best fly during this time was a parachute adams that just happened to very nearly match the stoneflies that were on the water in size and color. We have all heard this advice on catching big fish. Most have also heard people arguing for the other extreme, and with all the pictures (just one example of many) of hogs caught on tailwaters using small flies, I've been persuaded to spend quite a bit of time exploring this method. 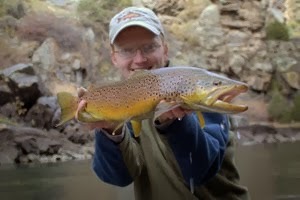 I even caught my own 20+ inch brown on the Taylor River in Colorado on a #18 CDC BWO this past summer and hooked some even larger on other tiny patterns. However, I recently was able to spot some fish in an area rumored to benefit from a shad kill. The fish looked fat and healthy from my vantage point, but I decided it would probably be good to do a more thorough investigation. In planning for my future assault on these HOGS, I realized that my streamer selection was woefully inadequate. So, this past weekend, I spent a bit of time at the vise trying to figure out how to tie a Zonker. The results were encouraging. For those that haven't wasted hours of their time on YouTube watching other people catch fish, this one's for you. This time of year, people's thoughts begin to drift to exotic destinations, often with a warmer climate. This video is of a trip that a group of Wyoming guides took to Mongolia...not the first place that most people think of when they start thinking "exotic locations." Anyway, these guys are after the great Taimen. For those who have not heard much about this fish, check out this video. It is a bit lengthy but a great movie. Here at the Trout Zone we are already trying to figure out a way to make the journey around the globe to Mongolia...hey, it is okay to dream!!! Well, it looks like it is final. 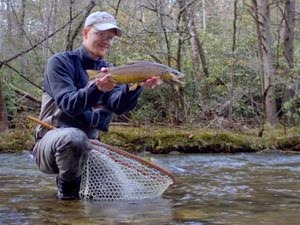 The National Park Service is planning to eradicate the rainbow trout population in Lynn Camp Prong in the Great Smoky Mountains and will return the stream to native brook trout water. Anglers are having mixed reactions to the news. The largest concern seems to be that most people hate to see the stream closed for the length of time it is going to take for a brook trout population to stabilize. 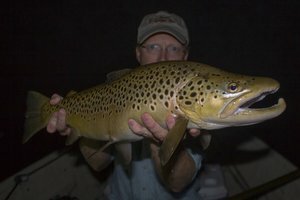 An excellent debate has been taking place on the subject on the Little River Outfitters message board which can be found here. 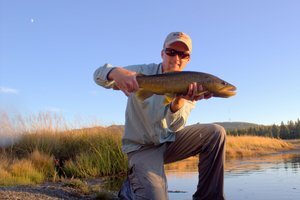 Around the country, it seems that the return of native fish species is becoming a major focus for fisheries biologists. Last year, anglers were saddened to learn that Bright Angel Creek in the Grand Canyon was being targeted for the removal of non-native brown trout. 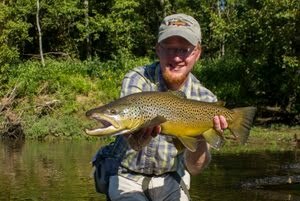 Being a trout-loving fly fisher, I have recieved news such as this with mixed feelings. I feel it is unfortunate to be losing some great fisheries around the country but at the same time, I support the return of native trout species. Obviously it would be a bit inconsistent to support the return of native trout but not other native fish species. 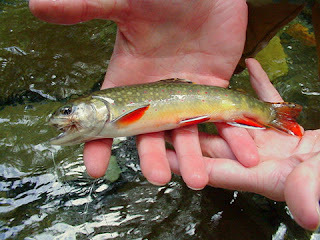 Fortunately in the case of Lynn Camp, the fish species that will be returning is none other than the southern strain brook trout. Despite some of the concerns I have with this project, I believe that the return of the native brook trout will ultimately be worth any short-term inconveniences. I look forward to another great place to catch this special fish!! !